Getting the Perfect Tan is so easy with Bronzan Tanning Capsules. Just one capsule daily + sun and your on your way to a great looking tan. ​Use Bronzan Accelerating Tanning Capsules all year around to keep your Melanin levels high then as summer approaches use your Melanoboost Peptide Sun Tanning Products to amp up your Sun Tanning Regime. ​Burning is your biggest enemy - Always use protection in the sun. Can I still get a tan while using sunscreen? ​The answer to that is that protection doesn’t stop you tanning, it stops you BURNING. If you protect yourself from burning, you are giving your skin a good chance of producing melanin. The bottom line is: the more comfortable your skin is, the happier it will be, and the better it will tan. Take your time and build your tan up slowly. What if I do Burn​? Burning is a serious issue. If you do get a burn, you need to take the time to look after your skin and help it heal before you go back out there. You should take yourself out of the sun immediately. Your body knows what to do to repair your skin, and you just need to give it the time to do that. There is not much you can do to speed up the process, but you can take steps to alleviate the pain and discomfort. How to get that PERFECT TAN -A warm, deep suntan is coveted by women throughout the world, particularly those with lighter skin tones. A dark suntan has the ability to make the body look slimmer, mask the appearance of stretch marks and cellulite, and cover up imperfections like blemishes and freckles. Create the perfect tanning conditions right in your skin with Bronzan. Using a tan accelerator without a doubt speeds up the whole process of tanning, and kick-starts your skin’s natural tanning process. The best results are seen when Bronzan is used in conjunction with regular sun exposure. In order to produce melanin, your skin needs the melanin building block l-tyrosine. Bronzan contains this and many more natural ingredients that feed your skin to produce a lovely golden tan. Bronzan Tanning Capsules builds a beautiful tan. Its advanced 100% natural organic formula offers an irresistible gold bronze tan. HOW DOES BRONZAN WORK? - Its formulated with essential tanning vitamins, minerals and antioxidants the works with the sunlight or tanning beds to promote your body's production of melanin, the skin pigment that makes us tan. Its great for all skin types even people with very fair skin or pale complexions. Tanning, or the production of melanin in your skin cells, continues for a few hours after you have been in the sun/ on a sunbed. So you don’t need to sit in the sun/ on a sunbed until you see a colour develop for you to know that you have gotten a tan. Your cells have already been stimulated to start the tanning process, and by giving your skin a rest after exposure (i.e. sitting indoors or in the shade after tanning in the sun) it will benefit tremendously in getting you the tan you’re after. HOW LONG BEFORE I START SEEING RESULTS? 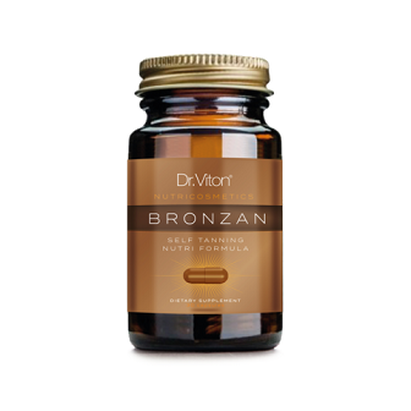 - Some users of Bronzan have reported seeing results in as little as 2 weeks while others take a little longer depending on there skin tone and exposure to the sun. General reports show by taking Bronzan and letting it build up in your skin good results were reached between 4-6 weeks of regular sun exposure. ​It is relatively easy to tan if you have fair skin. The only thing you need is patience. You are not going to tan overnight, but if you put in a little time and effort, you can build up the tan that you need with the help of Bronzan. MOISTURISE, HYDRATE & EXFOLIATE - Not only is it essential to keep your skin moisturised after tanning, but during tanning as well. Moisturise inside and out: so drink plenty of water and use a highly moisturising product on your skin like Prickly Pear Seed Oil. Exfoliate with our Microdermabrasion Crystals to keep your skin in tip top condition. THE NEED FOR D - One of the key vitamins for human health is vitamin D, which helps the body absorb calcium and other minerals that are essential for bone growth and repair. Our primary source of vitamin D is linked to sunshine so while your tanning your body is producing Vitamin D. The more skin that you expose the more Vitamin D is produced. ​WARNING - This product provides no protecton against harmful UV rays and does not protect you from getting sunburnt. Avoid excessive exposure to direct sunlight. Repeat exposure to unprotected skin may increase the risk of aging, skin cancer and other harmful effects. The main principle is simple: be good to your skin, and your skin will b good to you.